The channel brings tons of Raw event footage from venues all over the East coast and more! New original shows and drifting podcasts are already in the lineup! Hours of grassroots footage from 2017 and 2018 Club Loose, Ready Set Drift, Drift Evergreen, OSW Drift, Drift Nirvana, and Swingset LLC events. Special events like HyperFest, Low Style Heroes, Pro Brodown and Stacked Motorsports Festival, are also already in the lineup! New event footage being added weekly! We will be bringing grassroots drifting events from all over the US, as we look to partner up with and feature some of the best and up and coming drifting media from all over! New footage From our Partners, Reflections of Drift, Banger Clips, One Lap Kings, and others to be announced! New event footage will premiere the week following events in 2019! Check for local times and airing! Shows like “Function Beast”, Thursdays at 9 pm EST, which explores building and rebuilding Drift machines while following Evan and Jesse on their drifting journeys. “Catch My Drift w/Tucker Martin” showing new episodes Tuesdays at 8pm, is an original, always fun, drifting podcast discussing everything drift related and nothing at the same time! Into drifting video games? “PixeL Skids” showcases the virtual side of the drifting community. Games like FR Legends, Asseto Corsa, Forza Series, Torque Drift and more! Hot wheel setups, cool gaming rigs, online tournaments, the best car setups, and of course lots of footage from the drifting community! Craving some in car ride alongs? Our original series “Hot Laps” steps inside the cars to talk with the drivers and then strap in for some laps around the track! New episodes airing monthly starting April 2019! We also have a ton of shows in production that will be premiering throughout the 2019 season! Shows like “Lipstick and Clutch Kicks” featuring the female talent in drifting! 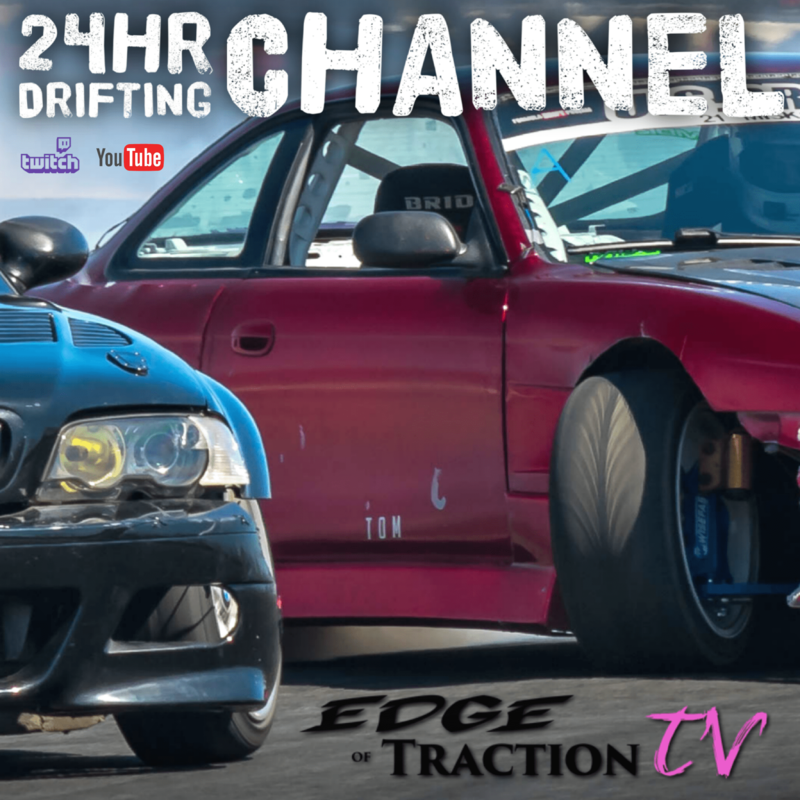 Interviews, shop hangs, car talk, and track-side footage, as host Becky hangs out with the girls of drifting in 2019! More shows coming this season include a Round-table, News style weekly show called “Traction’s Edge” premieres in April! New fun lifestyle series with the boys from Dream State Drift coming soon! Shows featuring RC and toys, Motorsports and drifting photography, New build series showcasing viewer’s rides and more! Have an idea for a show or series? Do you film or want to film drifting? Do you make drifting and car related content on YouTube and want to reach a new audience? We want to talk to you and put your content on Edge of Traction TV! Email us at edgeoftraction@outlook.com! It’s gonna be an exciting year as we launch this channel and build it into the premiere place to watch grassroots and Semi-Pro drifting! It’s your events, your cars, and your friends! This is Edge of Traction TV! Cool idea, guys! With enough partners and content contributors this could really take off. I’ll send you a message but I’m definitely in for more info!